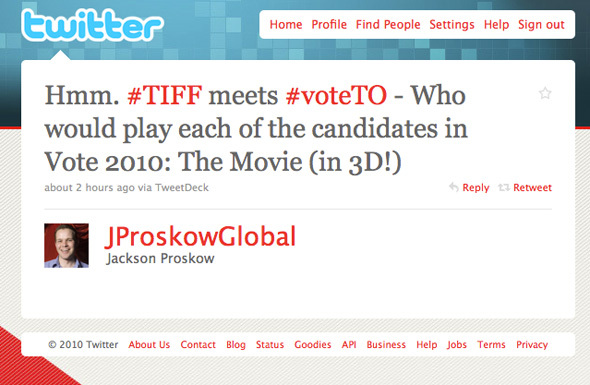 Earlier today Global News reporter Jackson Proskow sent off a comical TIFF-oriented tweet wondering which stars might play the roles of the mayoral candidates in the movie version of the 2010 municipal election. Forgetting how improbable such a film is -- even if they did make a movie about this election, it'd surely go straight to DVD -- I was immediately intrigued by the idea. The mere thought of how farcical such a film would be was enough to sustain my musings about possible star choices. The first candidate that entered my mind was Rob Ford. But, alas, the perfect actor to play him is no longer with us. Perhaps this is in poor taste, but I can't help but think the late Chris Farley would make for a mind-bogglingly good Rob Ford. Farley's predecessor, John Candy, would probably also have been great. But as ridiculous as this little exercise is, I decided I had to confine myself to living actors. So, for Rob Ford I solicited the services of Jonah Hill. Sure I'd have to get the make up team to put a few years on him, but otherwise I think he'd do a stand up job in the role of the divisive Etobicoke councillor. Choosing an actor to play Joe Pantalone was a bit more difficult. Although Pantalone lacks the fiery personality of many of the characters that Joe Pesci's played over the years, something about their shared first names and similar stature convinced me that Pesci was a better choice than Paul Sorvino (who I was also toying with). Smitherman posed a different set of challenges. On a visual level, I initially wanted an out-of-shape Bruce Willis to play him. The side-bonus of this choice was that I was pretty sure Bruce could really capture Furious George's angry outbursts. But, sadly -- at least from an entertainment standpoint -- Smitherman seems to have chilled out of late. That left Stanley Tucci, but he turned down the role. 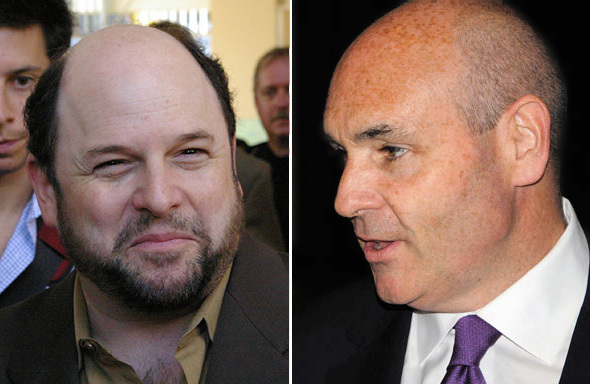 I was delighted, however, when Jason Alexander offered his services. Not a perfect fit, but the hope is that he'll really be able to relate to Smitherman as he attempts to make his own comeback. Rocco Rossi was a breeze. John Malkovich was available, and indicated his role in Burn After Reading -- as an annoying, but ultimately unsuccessful know-it-all -- had prepared him perfectly for this character. And last but not least, Sarah Thomson. There was some talk of Jodi Foster for this role, but ultimately the decision was made to cast Julia Roberts. The production team just felt that her work in Erin Brockovich would help her get in character for the flashbacks to Thomson's early career. Not only that, there's quite the likeness between the two of them. 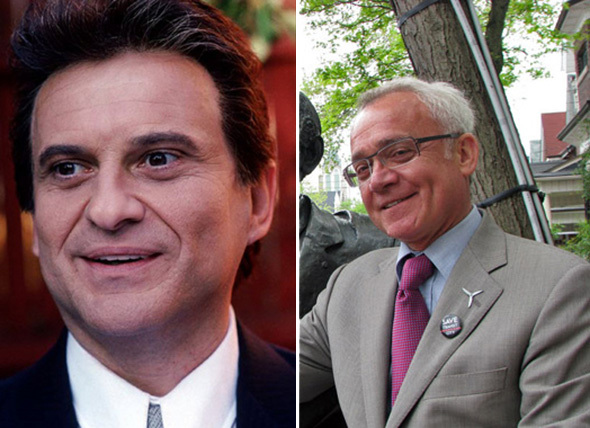 Who would you cast to play our 2010 mayoral candidates? Hat tip to Jackson Proskow for the idea upon which this post is based. 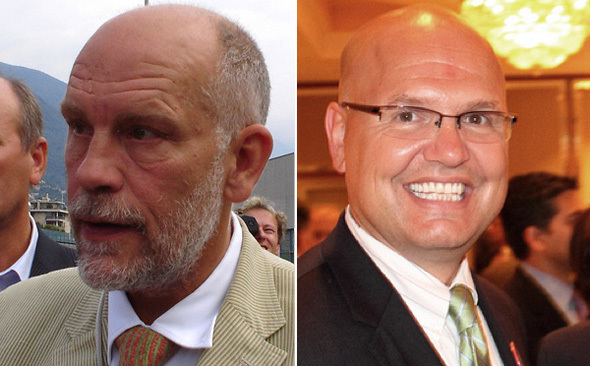 Photo credits for the mayoral candidates go to Tomasz Bugajski (with the exception of the Rocco Rossi one, which is from his Flickr page. Celebrity shots are from the following Flickr users (under a Creative Commons licence): shdowchsr, UN1SON, vhf and nicogenin.